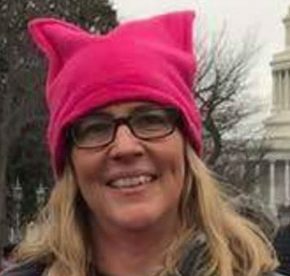 Tracie Yostpille, candidate for Mayor in Jackson, accused by OC Chronicle of having financial and political ties to Lakewood powerbase. In Howell, as in Jackson, Democrats are railing Republicans for adhering to the demands of COAH. Howell Democrats John Bonevich, Kristal Dias and Paul Dorato are mirroring a campaign running in Jackson by Democrats Tracie Yostpille, Brandon Rose and Paul Sarti. That campaign is being guided by Democrat political operative and former Lakewood Township County Committeeman Mitch Seim. Seim and Ocean County Democrat Party Vice President Marta Harrison have, in the past worked on three successful campaigns for Lakewood mayors. Harrison herself served as mayor of Lakewood. While Howell Democrats are railing against Republicans , painting them as enablers of the Lakewood community and responsible for the overdevelopment of Lakewood, their peers at the county and state level are sending a very different message. Senator Vin Gopal, who is a backer of the Howell Democrat campaign just introduced legislation in the New Jersey Senate that will send $13.5 million to fund private security in Lakewood’s private Orthodox school system. Gopal recently met with Avi Schnall, Director of Agudath Israel of America and is essentially the muscle man of the Lakewood Orthodox Community. Schnall commended Gopal’s funding bill that would bolster finances for the Lakewood private school system. Moving up one more level in the Democrat hierarchy of New Jersey liberalism, we find Josh Welle, who is running for Congress against Republican incumbent Chris Smith. Welle has stated on numerous occasions that both Jackson and Howell residents are racists and anti-semitic. It has been a cornerstone of his campaign platform to rally support from the progressive left, essentially a war against those who are upset over the changes occurring in both towns as population expansion from Lakewood flows into both Jackson and Howell. According to Welle, residents of Howell and Jackson “aren’t ready” to move in the direction New Jersey Democrats are seeking to achieve. Welle probably isn’t going to get many votes in Jackson or Howell after his blanket accusations, but he has made it clear…if you’re “Jackson Strong” or “Howell Strong”, you are the problem, not the solution, which contradicts the platform of the local municipal candidates. Finally, at the state level there’s Governor Phil Murphy, the grand champion of New Jersey Democrats. This week, Murphy snuck away to Israel, along with Rabbi Aaron Kotler, head of Beth Medrash Govoha and elder statesman of the Lakewood VAAD. Prior to departing to Israel, Murphy held a top-shelf fundraiser for Welle with Hudson County Democrats. Photo published in the Toms River Times. Mitch Seim, Democrat operative who once lived in the home of the mother of former Lakewood Mayor Marta Harrison. Seim is suspected of operating the campaign of Tracie Yostpille for Jackson Mayor and working with Howell Democrats and Eatontown Democrats. While in Israel, Murphy, like Joshua Welle, used an international stage to rail against what he calls anti-semitism in New Jersey, specifically, Howell and Jackson, with Kotler by his side. After the conference, Murphy and Kotler spent one on one time together. The topic of that discussion has not yet been released by Murphy’s administration. 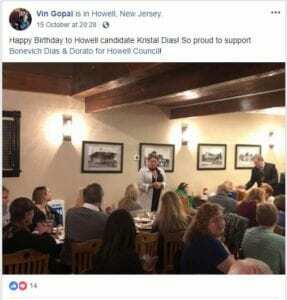 The unanswered question becomes, how do municipal level Democrats in Howell maintain the autonomy from Democrats at all levels of the New Jersey’s liberal power structure? How does a campaign that is rallying against Lakewood incursion, who is taking direction from the like of Gopal, Murphy and Seim react once they are in office? Will New Jersey’s radical left, which supports them stand for rhetoric against Lakewood…especially when Governor Phil Murphy is right now in Israel trying to get Israeli firms to set up shop here in New Jersey, with the head of the Lakewood VAAD at his side? It doesn’t paint a pretty picture for local Democrats, unless they are simply just using the fear of Lakewood as a rallying call, like the Jackson Democrats just as a means to gain power in the communities surrounding Lakewood. It’s what we usually call a bait and switch. Some refer to it as “Manchurian candidates”. It is now up to Howell voters to decide whether their town will be governed by a single platform, a rally against Lakewood, being called by those same Democrats who are the enablers of the problems of the town, or to have continued faith in a Republican ticket who is just being honest about how it all works, understanding that if they fight too hard against Murphy and the Trenton Democrat agenda, Howell could fare worse than it is now. Is Howell ready to join the “Blue Wave” that is sweeping across the state and the Jersey Shore? We’ll find out in a just a couple of weeks. While the elections in Jackson and Howell are very important for residents, they are more important for the Democrat power structure in New Jersey and Mitch Seim, who need election wins this year, to continue the “Blue Wave” sweeps in 2020 through Toms River, Brick and Berkeley Townships. Howell and Jackson are now the front line battleground towns in a fight to keep the hands of money hungry tax and spend Democrats out of our region. While Democrats are rallying against problems caused by Trenton’s COAH mandates, neither the Howell or Jackson Democrats have laid out plans on exactly what their plan will be, other than, “pick us, they’re bad”. We’d like to see a solid campaign platform from liberals in both towns presented to voters. time to bury any hatchets, unite, and for God’s sake, win in our biggest area town! We need Howell, to keep Monmouth great! Hey Art & Phil, this is the same Mitch who worked for John Pallone and his team in Long Branch. The guy is shady. He has his hands in quite a pile of things and not for the benefit of the people in YOUR local community, he is in it for himself personally and HIS community. He is not trust worthy, very much a “hey now you owe me” guy. Voters should look for people like Mitch who operate behind the scenes and reject the candidates he is pushing as he pushes them for his own purposes and his iwn personal gains. The problem with the Democrat Party at all levels is that they have no ideas. That’s why you see them having to resort to intimidation, violence, rioting, and false allegations to try and gain power. If Democrats were ever truthful about what they really want to do, they would get crushed in every election. This is unbelievable. The Dems are flooding Howell mailboxes slamming Lakewood development coming to Howell while their Chair takes money from Lakewood developers and then that $ gets funneled to the same Howell Democrats. That takes some set! Creeps and fakes they are. by the GOP in both towns. Let the Dems play both sides and have it blow up in their face and take control of Howell and Jackson. Afterwards, take cash from the Lakewood developers and form a solid partnership with the major players in the Orthodox community. Very happy I don’t live in either town.